This year, Old Hamptonian Lodge celebrates the 75th anniversary of its consecration on 23rd March 1938. This is a draft design for cufflinks commemorating the occasion. Posted in news, Image format on 01/04/2013 by oldhamptonian. This is a reblog of a post from the Federation of School Lodges about booking for the 2013 Festival. Posted in news on 24/02/2013 by oldhamptonian. It was with great sadness that the lodge learned of the death of Bro. George Warder, PPrGPurs on 1 December 2011. An Old Hamptonian, George was proposed into the Lodge by his brother-in-Law Cyril Tarrant and seconded by Bill Yarrow. He was initiated on 16/10/1965 and raised on 10/12/1966. While he had no ambition to go through the chair he was happy serving the lodge in any way he could. A stalwart of the Lodge of Instruction, George served for many years as Assistant Secretary and Assistant DC. He was promoted to PPrGPurs as a Lay Brother for his dedication to the Lodge in 2002. Posted in members, news on 05/12/2011 by oldhamptonian. We’d like to share with you a taster of what we do at a White Table Meeting at Staines Masonic Hall on Saturday, 11 December 2010 at 3.15 PM. We’ll tell you about what we get up to, show you around our meeting place and feed you well. Give Marc Brunel-Walker a call on 07711 421950 or email marcbw@hotmail.com if you’d like to attend. Our poster for the White Table meeting. Please quote this new address when referring to the site. hamptonian.org no longer belongs to the lodge. oldhamptonian.wordpress.com will work, but as it is a bit more of a mouthful, I recommend you stick to oldhamptonian.org! It is with sadness that the lodge has received news of the death of Cyril Tarrant on 31 May 2010. Born in 1923, Cyril was 87. He attended Hampton School and emigrated to Australia in 1966. He was master of Old Hamptonian Lodge in 1956. After leaving the Chair in the sixties and acting as ADC then DC of the Lodge, Norman Rowe, Secretary of 5730 for many years, regularly gave a lift home to one of our founders, Harold Brandon. On Norman’s appointment to AstProvGSwdB Harold insisted on giving him a sword from his collection and a postcard depicting a member of his family with the sword on a ceremonial March in Scotland. 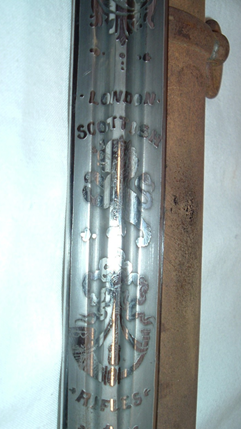 On closer inspection, I noticed historic, royal, military and masonic engraving on the blade, so I looked for the Regiment on the internet and found the Website for the ‘London Scottish Rifles’ which showed their military history dating from 1859. The sword was in a terrible state, so after taking photographs, making notes and reference marks, I then began to dismantle it, cleaning its sharkskin handle, red hide/suede knuckle glove and crimson tassel which took me about three days. The steel of this blade is of the highest quality as would have been used for battles in the nineteenth century for both faces contain blood grooves. 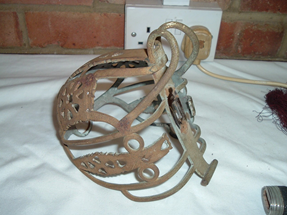 It would have had no engraving, only the maker’s hallmark, also after any ceremonial display, the cage guard would have been removed and a cruciform re-fitted for use in battle. 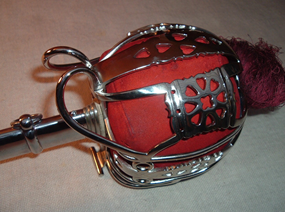 The polishing of the rusty metal scabbard and effecting electro nickel silver plate to the cage guard and pommel was done by a specialist company at Isleworth and may I say that they were overwhelmed by this beautiful creation. When collecting it, I asked how best to preserve its finish and was surprised when they said “Just apply plain wax polish regularly to the metal and nothing else”! I then contacted the London Scottish Rifles’ Regimental H.Q. & Museum in St James’s and spoke to their Secretary Major Stuart Young, thus obtaining its historical provenance; and confirming its possible Masonic origins. He inquired if I wished to sell it but I said that I would get back to him as it did not belong to me. In the UGLE year book, I found that there was a Lodge attached to the London Scottish Rifles – number 2310. I phoned their secretary and gave him Norman Rowe’s details as he was the owner of the sword. After which it was finally decided by Norman that when the sword was fully refurbished we could present it back into the military lodge’s care. The lodge hold their LOI at the Regimental HQ and their lodge meets at Clerkenwell. It is 101 years since these volunteers were formed into a regiment, prior to being under the command of King Edward V11; and it is frustrating for Norman that he remembers that there was a photograph given with the sword depicting it in a famous procession of 1908 to celebrating this occasion, but unfortunately it has gone astray. On Thursday 28th January 2010 a delegation of members of Old Hamptonian visited London Scottish Lodge at their Burns Night meeting in Clerkenwell, where the sword was presented to them with much ceremony. Photographs courtesy of Ron Saunders. The Old Hamptonian Lodge of Instruction Barclay Night Supper will be held on Friday 7th May 2010 from 7:00pm to 10:00pm.